Frozen shoulder as the name suggests to the severe limitation of shoulder movement accompanied by pain. According to the epidemiological studies, it is found to be more common in women than men within the age group 40 to 60 years with a higher incidence in diabetes patients. Frozen shoulder has a gradual onset which means it takes days to weeks to months after the onset and then gradually declines-freezing stage. As its cause is unknown, the histological studies suggest capsular lesion with limitation in the lateral rotation most followed by abduction and least medial rotation, which is a typical capsular pattern. The shoulder joint is involved in our daily activities like bathing, grooming, cooking. Moreover, this nagging pain with inability to do these activities makes us feel handicapped. In early stages, pain is too much to do any exercise so; your physiotherapist will try to reduce the inflammation and pain by electrotherapeutic modality and gradual passive mobilization. 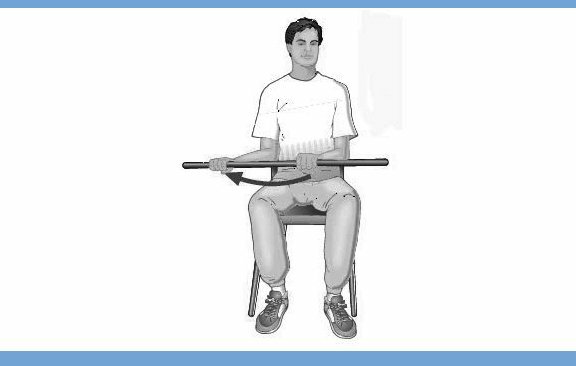 As pain decreases, one must start with effective exercises initially under the supervision of a therapist and gradually at home.The basic aim of these exercises is to increase the extensibility of the capsule and improve shoulder mobility. Here below you will find the core exercises for frozen shoulder. Remember to listen to your body; stretch is the point of tension, not pain. Stand with your opposite (good) hand resting on a chair or table. Let your other (affected) arm hang down and try to swing it gently backward and forwards and in a circular motion. Repeat about 5 times. Try this 2-3 times a day. Face a wall at a 1-foot distance. 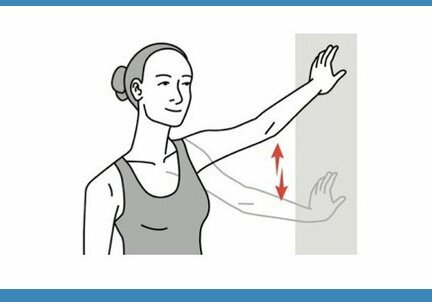 Touch the wall at your waist level with fingers of your affected arm and walk the fingers up the wall like a spider crawl to the point you can comfortably raise your arm. 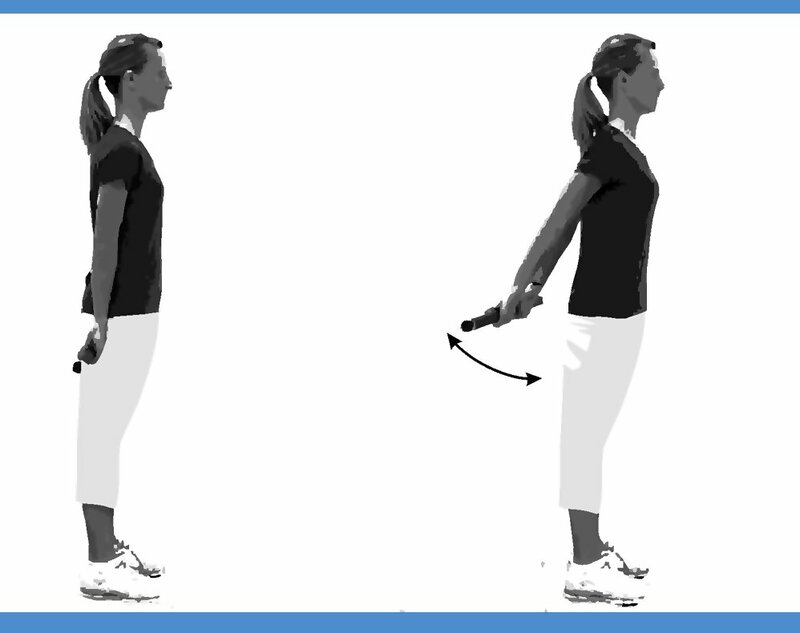 Another variation of this exercise is the stand sideways off the wall with your arms at side with elbows slightly flexed and then walk up the wall. You may change the angle of your arm according to your comfort. Repeat this 10 times twice a day. 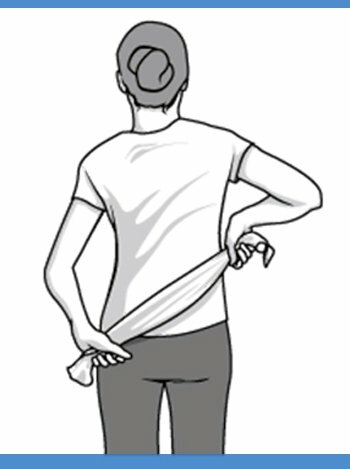 Hold one end of a towel behind your back and grab the other end with another arm. 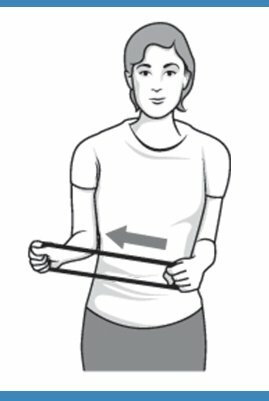 Place the towel in a horizontal position and try to pull affected arm upwards with the unaffected arm pulling the towel. Do this 10 -20 times a day. After this exercise, if you experience pain and soreness in affected shoulder, place a cold pack for 10 to 15 minutes within 30 minutes. 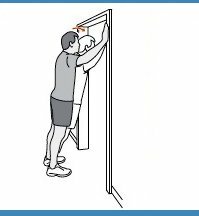 Stand in a doorway with both arms on the wall slightly above your head. Then slowly lean forward until you feel a stretch in the front of your shoulders. Hold 15-30 seconds and repeat 3 times. Stand and raise your shoulders. Hold for 5 seconds. 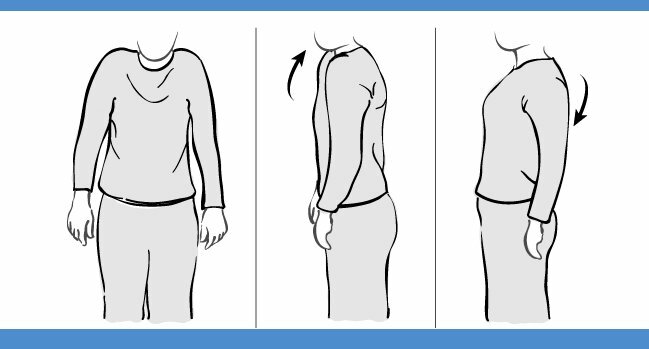 Squeeze your shoulder blades back and together and hold for 5 seconds. 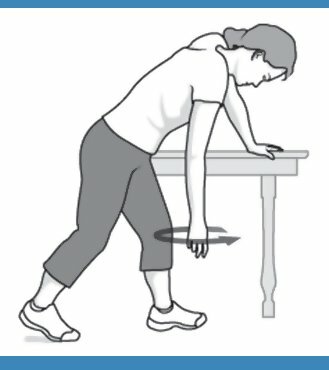 Pull your shoulder blades downwards and hold for 5 seconds. Relax and repeat 10 times. You can perform this exercise in lying or stand upright position. Hold a stick in both hands, palms down. Stretch your arms by lifting them over your head, keeping your arms straight. Hold for 5 sec and return to the starting position. Repeat this exercises 10 times. 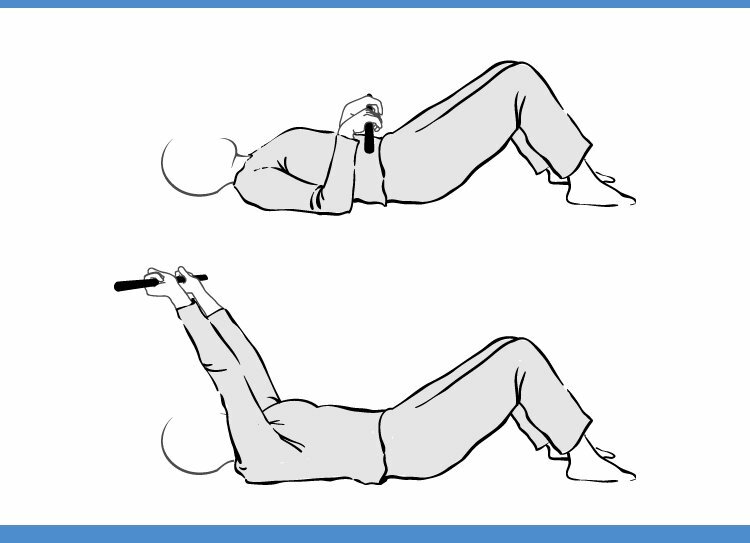 You can perform this exercise in sitting or lying on your back with one elbow at a right angle. Hold a stick with both hands. Push stick with the help of both the hands. Push the stick to move the arm outwards. Hold the stretch for 5 sec. Repeat this exercise 10 times. Stand holding a stick behind your back with your elbows straight. Lift the stick upwards away from your body. Hold this position for 5 sec. Relax and return to the starting position. Repeat this exercise 10 times. Frozen shoulder is a condition that limits the ROM (range of motion) of your shoulder. If you feel pain and stiffness in your shoulder, consult an experienced orthopedic specialist. Various treatments (medical management and physiotherapy) may ease pain and improve the movement of your shoulder. You can take painkillers to ease the pain. Taking them before exercise can help you stay active without discomfort. Through cryotherapy (ice pack), learning how to protect your joints and being aware of your posture will help cases of shoulder pain. Try exercises mentioned above to help ease pain and prevent future symptoms. Shoulder Pain cross body reach, Door Lean, External Rotation, Finger ladder, frozen shoulder, frozen shoulder exercises, Pendular stretches, shoulder pain, shoulder pain exercises, shoulder rolls, shoulder stretches, Shoulder Stretching, towel stretching, wand exercise. permalink. 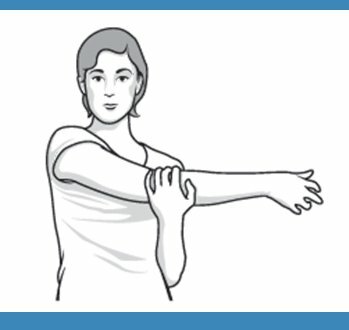 The top 10 exercises for frozen shoulder is very helpful for patients in daily routine. It has given good advise the patients, keeping in good health at this time. I am suffering from this problem from last 5-6 months. 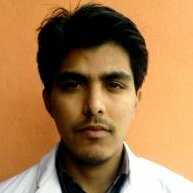 Since I am a diabetic patient and have consulted many orthopedic doctors, but no signs of improvement. Will try these exercises now and hope to have little improvement. Thanx for the share ! !